According to the mainstream Indian media, there are currently three main political trends emerging across India today: the emergence of an anti-corruption party – the Aam Aadmi Party (“AAP”), rebranding of the incumbent Indian National Congress’ (“Congress”) along the lines of its new-found activist streak spearheaded by its leader Rahul Gandhi, and finally the nationwide mobilization of supporters of Bharatiya Janata Party’s (“BJP”) Prime Ministerial candidate – Narendra Modi, from heartland states of Uttar Pradesh and Bihar, to distant West Bengal, Kerala, Nagaland, and surprisingly even Jammu and Kashmir. Although all three trends have been correctly acknowledged by the media, the argument that each is equally significant as the other is simply inaccurate or worse, propagandist. What the liberal media fails to do is differentiate between the impacts of each of these trends, resulting in the creation of incorrect assertions about the probability of success of their respective outcomes. Case in point was the latest round of recently concluded Assembly elections in the heartland states of Rajasthan, Madhya Pradesh, Chhattisgarh, and of course Delhi. These elections were a watershed moment in modern Indian politics, and the verdict was abundantly clear, as much as the mainstream media tried to obfuscate it – the most significant trend was that BJP under its firebrand nationalist leader, Narendra Modi was the biggest winner. The party received almost 72 lakh more votes than its nearest rival – the Congress. Yet, if you were to believe the media, results from the three states where the BJP performed spectacularly were hardly worth noting. The only result that mattered to them was the hung assembly of the most densely populated state in India – Delhi. AAP’s debut of winning 28 seats out of total 70 available seats was mighty impressive, but their seat tally was still less than the 31 seats BJP won (BJP lost six seats by a margin of less than 1000 votes). If there was ever a chance for an upstart party to emerge unexpectedly, it would have to be in the most densely populated state of India. While campaigning in Delhi requires the support of small apartment societies, colony administrators and community meetups – mohalla sabhas (door-to-door campaigns); to take your message through spread-out districts in the desert state of Rajasthan, and densely forested, Naxal-infected Chhattisgarh is way more impressive. Winning by three-fourth majority is unheard of in today’s fractious electoral system, and to do that in one of the biggest states of the country where you’re a 10 year incumbent is absolutely astounding – like the BJP did in Madhya Pradesh. The message of the latest assembly elections, the last polls before the Grand Slam event of 2014 General Elections this summer, was that the BJP was the most desired political party, with its charismatic leader Narendra Modi at the forefront of this ‘saffron’ wave engulfing the country. This brings me to the second part of this long overdue post. While we all have a set of core political, economic, and social beliefs that remain unchanged over time, i.e. ideology; there are times when one must make choices that are better for the greater good in the face of the realpolitik. For example, when I supported the Congress Party in the 2009 general election, it was because the previous Congress government (UPA I) had provided India with energy security (Indo-US Nuclear Deal), cushioned the economic recovery after the global recession and managed terrorism as effectively as any past governments had managed to do. Although this was completely against my core ideologies of secularism, free-market economics, privatization, etc., I believed the Congress party back then was best positioned and better prepared to tackle the issues at hand compared to the opposition BJP – which found itself vision-less and in complete disarray after Atalji’s retirement from politics, with little chance to form the government (As was later found to be true – the party won its lowest vote share in more than 20 years). Although I would have hoped for a utopian political alignment to form that would open retail, insurance, and defense industries to foreign investment, privatize railways (to the extent possible), ports and airports, increase spending on national security, reduce wasteful implementation of subsidy programs, usher in an era of nationalism and true secularism into our society’ fabric; there was no party in 2009 that could offer that, and definitely not the BJP at the time – the party I’m most ideologically aligned towards. And so the decision to support Congress was based on the realpolitik. I was too scared for a haphazard coalition government to form at the center with the support of Communist Parties when our nation was going through a precarious national security (26/11 aftermath) and fragile economic situation. The choice for a lesser evil at the time was between Congress and a hung parliament scenario with a nightmarishly weak socialist coalition government. For many, 2014 is a decision to choose the lesser evil. The incumbent Congress Party has realized that winning anything close to a majority 272+ seats in a parliament of 543 seats is almost impossible, in fact winning a meagre 100 seats should kick-off wild celebrations in the Nehru-Gandhi household. The choice today then is between the well-oiled engine of BJP’s 272+ mission, one that has presented clarity in vision and decisive execution, versus a hung parliament scenario with an undecided leader, unclear vision, uninitiated responsibility, that will eventually lead India to an uncertain future. Between 1998-2004, under the able stewardship of Atal Bihari Vajpayee, the BJP government built more roads than were built in all the other years since 1947… combined! Vajpayee led India to a decisive victory in the 1999 Kargil War against Pakistan, strengthened nation’s sovereignty with the establishment of a nuclear weapons defense program, and most importantly clocked higher GDP growth rates than many developing countries in the world, with careful implementation of fiscal consolidation –this in spite of the economic sanctions that were placed by the western world in response to India’s nuclear tests. There were fewer internal disturbances during BJP’s tenure and strong anti-terror laws were passed (later annulled by Congress) to curb the growing threat from religious fundamentalists in the wake of 9/11. The BJP also had the first ever divestment ministry to remove government from the business of doing business, while being instrumental in beginning the process of privatization of ports and airports, introduction of the Lokpal, Right to Information and Sarva Shiksha Abhiyaan. In states where it is in power, the BJP has a stellar track record of good governance, greater economic freedom, inclusive growth, and it may come a as surprise to some but a largely peaceful environment of religious freedom without state interference. The states of Gujarat, Madhya Pradesh, Chhattisgarh and Punjab consistently rank amongst the best states in Human Development Index rankings, economic growth, ease of doing business, agricultural and manufacturing growth, infrastructure development, and employment opportunities. BJP’s Chief Ministers are either talented professionals with engineering and medicine backgrounds or grassroots leaders who emerged as ardent volunteer workers ‘sangh pracharaks’, dedicating their lives to serve the people of their country. It might come as a surprise to an avid mainstream media viewer, but it was, in fact, the BJP that gave the country its first IIT-graduate Chief Minister, in the state of Goa – Manohar Parikkar. For all the witch-hunting by the ‘liberal’ mainstream media in India, the BJP may well be the party with a difference as it claims to be. In 2014, the side contesting the BJP constitutes parties who are either still in the process of forming their base-ideology and governance vision, fanning pseudo-secularism, or worse wasting critical government resources on bone-headed policies and schemes that are destined to leave the economies of their respective states in shambles for many years to come. In Uttar Pradesh and Kerala, vote-bank serving governments are introducing religion-based subsidies and quotas that are reminiscent of the regressive Jaziya tax on majority communities, applied by religious persecutionists of the Mughal era. West Bengal’s Trinamool government has created such a massive welfare state that has made even the Communists, who ruled Bengal for 30 years before her, look like champions of free-market capitalism. Meanwhile for Congress, it seems like Rahul Gandhi – the party’s heir apparent, has already given up any hope of forming the next government. His constant refrain of improving the Congress party from within, empowering poor, and establishing internal democracy has given stand-up comics a lot of material but will take years to actually fructify – that is if the scion is serious about these lofty ideals. His are ideas that can transform the Congress party from being a vote-bank oriented mai-baap party to a credible alternative to BJP’s center-right model. But again, this will not happen overnight and definitely not in the next 50 days. Rahul Gandhi must spend his time in the looming opposition resurrecting the grand old party of India, so that it can, one day, take over a further developed nation from the BJP and implement welfare policies that a (moderately) rich country can afford. The party in news though is Arvind Kejriwal’s Aam Aadmi Party. While the earnest nature of AAP’s rise is commendable, its supporters and well-wishers must understand that a country doesn’t run on good intentions alone. The chaotic 50 days of AAP’s stab at governance in Delhi, were a great example of how a vision-less contrarian party with activists running the show end up providing a guerrilla form of hit-and-run governance, which is not only unsustainable but also a recipe for disaster in a country the size of India. But there is a long way to go before AAP can represent the aspirational class that it believes it presently does. It must work hard to establish and grow its fundamental grassroots level structure, expand its vision – making it broader than just a ‘Ram Baan’ medicine of Lokpal that it believes will solve all our problems. Most importantly, AAP must find leaders from within its young new supporters, and distance itself from the current crop of failed journalists, naxal-backing social activists, and rabble-rousing mob leaders – suddenly tasked with administrating a constituency of millions of people. All this while acquitting itself of any subterfuge, be it its curious relationship with the left-liberal US based Ford Foundation or its stone cold silence on corruption charges against the Gandhi family. India’s ‘liberal’ hero – PB Mehta even argued in his recent article that the existence of Plutocracy and corruption isn’t the only problem ailing India (read the article). There is a fear of governance paralysis, a clear weariness to agitation, and a growing fear of joblessness and economic doom. Taking on Plutocracy is a marathon, not a sprint, AAP’s dramatic fracas week after week has only exacerbated this fear of constant agitation and government paralysis. AAP’s time will come and when it does, it may even lead to the transformation of our country to the utopian society I discussed earlier – one that is removed from the influence of crony-capitalists, fixers, middlemen, ridding us of the Plutocratic society that our current democracy has come to represent. But that day is still in the pipeline, the idea in its infancy and will not be ready in the next 50 days. AAP has successfully created a potent ecosystem for disenchanted youth and honest bureaucrats to be the change they have wished to see in the country. Now is the time to nurture this ecosystem. AAP needs to strengthen this support and channelize it so that India can possibly have three governance alternatives come 2019. But it seems like the current AAP leadership is in some sort of hurry, may be it thinks a Modi-led BJP government will dilute the strength of its support, or maybe it is in reality a concatenation of closet Congressis who can obviously not air their support for Congress under current circumstances, and would never have voted for the BJP anyway. Whatever is the case, PB Mehta summarized it well when he said that the AAP had the opportunity to “tap into a prosecutorial instinct we are developing against plutocracy, but also to demonstrate a steady trustworthiness in governance”. It blew it, and today stands woefully exposed in front of those that gave laid their hopes on the ‘new paradigm’. The realpolitik of 2014 will have many twists and turns up until May, but it is clear that no party this time around has all the answers to our nation’s problems. For some, there is again a choice to be made for the lesser evil. But this time around we have a strong alternative in Narendra Modi – an alternative that is credible, experienced, visionary, and perhaps the only one capable of pulling India out of its current mess, with ideas that may even reroute us back on the path to double-digit growth. The choice is between the hope of a stable government enacting policies that usher in renewed growth, kickstart the investment cycle, remove uncertainty for foreign investors, lower inflation by removing supply-side bottlenecks, or a pack of rabble-rousers in a fragmented realpolitik pulling the nation in a thousand different directions. 2014 will also be an opportunity for voters to affirm that development and good governance deserve a chance over politics of vote-bank pandering and endless government activism. There exists today an alternative to the current malaise, one that envisions harnessing of renewable sources of energy, building 100 satellite urban centers, unshackling infrastructure and power reforms, while decentralizing power for aid development. The alternative wants “Sabka Saath, Sabka Vikaas“; and I believe it is time for the populace to unite under Mission 272+ and answer the call of realpolitik de 2014: that of choosing Development for all, Appeasement to none ( link). I first got interested in diplomacy and the United Nations as a teenager, around the same time you emerged as a strong contender for the post of UN Secretary-General. Regardless of that result, I was fascinated by your career as the most successful Indian in the field. My fascination soon turned into fandom as I was inspired by watching your interviews and speeches. I memorised your TEDtalk, I aspired for the Tufts MALD program, I rattled off your remarkable achievements in casual conversations ; so much so, that my friends started referring to me whenever they heard or read your name. You were my idol. And then you decided to enter Indian politics. That decision gave millions of people, like me, hope that our rotting political system can change. You were our ideal MP – highly educated global thinker, eloquent speaker and a seasoned politician; a combination of competency, experience and integrity rarely seen before in Indian politics. Regardless of which party’s ticket you ran with, people would have voted for you in 2009 – as evidenced by your thumping margin of victory despite being an outsider to Thiruvananthapuram politics. But 2014 is a whole new ballgame. The mood of the country has changed, hopefully irrevocably. Over the last few years, the UPA and most state governments, across party lines, have engaged in open and blatant abuse of power. Corruption, nepotism, misgovernance and votebank politics have become alarmingly routine. But, more importantly, the emergence of a strong media determined to showcase stunning exposés and the mass awakening against corruption, led by Anna Hazare, has led to dizzying levels of political awareness in India. People want change. We will oppose identity politics, we will reject dynastic politics, and most of all, we will punish brazen corruption. You, of all Parliamentarians, should recognise this trend and join us in eliminating these archaic and immoral practices. But, these days, the more I listen to your interviews, hear your speeches and read your tweets, the more it seems you have lost your once fiercely independent voice. Before you joined Indian politics, you have openly criticised the Congress Party, its “true dynastic tradition”1 and its corrupt core. In your book, From Midnight to Millennium, while recollecting Rajiv Gandhi’s term you wrote that after a promising campaign, “the rot set in…Compromise followed sellout as New Delhi returned to business as usual”  as this government too was charged with massive corruption. Do you honestly believe that Sonia Gandhi, the woman you are so loyal to now, and the other Congress stalwarts who continue to rule today, were not involved in what you yourself call, the “sellout”? Yet, just last month, despite the deluge of corruption scandals over the last few years, you unambiguously defended the UPA’s term harping on outdated phrases and a spasm of extravagant statistic-listing in The Indian Express . You call India a “thriving, entrepreneurial and globalised economy”, when inflation, investment levels, balance of payments, the Rupee’s value and other key economic indicators have all worsened exponentially. You declare that the UPA is responsible for substantial employment generation, despite The Economic and Political Weekly and even a government study terming these numbers grossly exaggerated  . You even go so far as to state that “the UPA governance has changed the face of our society”. Yes, Dr. Tharoor, it has. And the face of our society is mutilated beyond recognition. Please realise that every day you continue to endorse and defend the Congress Party, you lose your own moral high ground and become part of the herd of mindless politicians this country has unfortunately elected. It is, quite frankly, insulting to see educated ministers not having the courage and honesty to admit obvious lapses in governance and then absolve the UPA government of all corruption cases without trial. It is, quite frankly, embarrassing to see experienced parliamentarians, including yourself, acting like court sycophants, falling over each other to praise ‘Rahul baba’, a man with no notable experience or achievement . Let the other obsequious partymen sacrifice their self-respect and dignity at the altar of the Nehru-Gandhi family. You, Sir, deserve more. You have accomplishments of your own throughout your glittering career as a diplomat. You deserve respect from common people like me. And we need educated, independent and sensible voices in Parliament. Please do not sacrifice our hopes of change by succumbing to the Congress disease of sycophancy and dynastic politics. I do not ask you to jump into the Modi camp either. It doesn’t need extensive research to know that you are ideologically against what the BJP stands for. I am no fan of the BJP; I believe the BJP has been a grossly irresponsible opposition party guilty of insulting Parliament through regular disruptions and corruption at the state-level on countless occasions. As a Bangalorean, I was thrilled when the BJP lost the Karnataka elections last year. Because it proved to me, as it did to you, that Indian voters were ready to punish, in your own words, “flagrant financial malfeasance…charges of nepotism and crony capitalism, real-estate and mining scandals, policy paralysis” . But in your Project Syndicate article, you took that premise and somehow managed to come to the conclusion that it bodes well for the Congress. You are far too experienced a politician for me to expect that you do not recognise the massive failures of the UPA government, or the current political climate against the UPA. The Congress-led central government is guilty of everything the BJP-led Karnataka government was, but on a larger, more devastating scale. I do not discount your significant contributions as Member of Parliament, Foreign Minister and Human Resource Minister. But as a well-wisher and a patriot, this is my plea: please, leave the Congress Party. Contest as an independent and voice your independent opinion in parliament. Continue all the good work you have been doing in your constituency . I have heard first-hand that Thiruvananthapuram has changed for the better since 2009 because of your active and sensible leadership. Continue raising India’s international profile using your invaluable experience as a former UN diplomat. Your proactivity and sensitivity as Foreign Minister was instrumental in nurturing important diplomatic relationships with states across the world as evidenced by numerous testimonies . Continue contributing to our policymaking in Parliamentary committees. Your initiatives have found support across party lines primarily because your reasoning is backed by a career of political and developmental expertise. And finally, continue giving us hope that capable and honest individuals can exist in Parliament. In fact, beyond setting an example, you could lead the charge and promote the idea to other qualified, educated, and most importantly, honest people across the country. I have faith, Sir. I have faith in you and in our country. Millions of my peers do to. Please do not disappoint us. A well-wisher, desperate for change in India. The India Today group has been running opinion polls before general elections for several years now and their track record is surprisingly not that shabby. They conducted the first of such polls for the 2014 General Elections with a dummy variable: Modi as PM candidate. The results were significant but far from surprising. When Modi was not projected as the PM candidate by BJP the seats allocations were: 179 for BJP; 132 for Congress; and 232 for the 3rd front. On the other hand when Modi was projected as the PM candidate both the number of seats to BJP and Congress increased. The benefit, however, was greater for BJP: 41 more seats to BJP; 23 more seats to Congress; and 64 less seats to the 3rd front. The logic behind this is very straightforward: Modi polarises the electorate. Majority muslims fear his rise to power and vote for Congress instead of their local party. Even though they might hate Congress, they are willing to put up with them as long as Modi does not achieve the PM mantel. The others vote for Modi because of his track record in governance and the image he has been able to cultivate for himself as a man of action and not just of words. 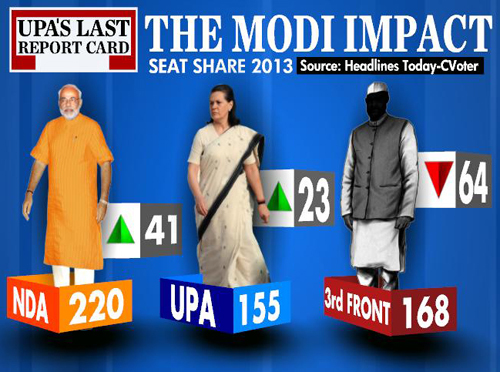 After UPA IIs deplorable performance, many people yearn for a strong leader which they see in Modi. For this they are willing to neglect their local/regional loyalties and vote of BJP. Nitish Kumar’s strategy: Back fired? Nitish Kumar, the current, popular Chief Minister of Bihar, recently broke his alliance with BJP over their insistence of portraying Modi as the Prime Ministerial candidate. He had hope that he would be able to blackmail BJP, being its chief ally, into not having Modi as the PM candidate. However, according to the survey, this turned out to be good news for BJP. If JDU (Mr Kumar’s party) were to remain in alliance with BJP, the Bihar votes would remain with them. However, the preference for Modi is so great that the voters will ditch their loyalties to JDU and vote of BJP diminishing JDU’s power considerably. The fact is: People either hate him or love him. The ones that hate him are willing to settle for anyone but him, and the ones that love him simply will not compromise. Why Vote For The BJP? Over three h undred and fifty parties contested the last general election in 2009. Thirty eight parties are currently represented in the 15th Lok Sabha. The next Lok Sabha elections will see many more parties enter an already crowded political spectrum. An average of seven political parties (along with independents) shall contest any given constituency in the country. 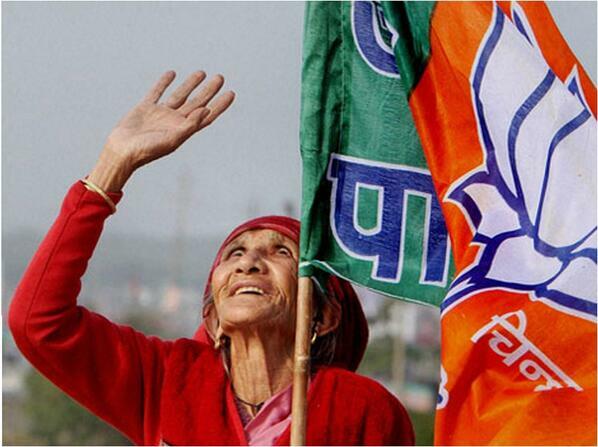 With so many different options, what separates the BJP from the rest? Why should the party deserve your vote any more than the rest? Most of us who have voted before, have ended up selecting candidates for the WRONG reasons. Many people vote in India without having done any research on the candidate or the party he/she represents. Over 90% of people in India have absolutely no clue what values, principles, beliefs and legislative agenda the Congress and the BJP represent. People read and see the news, but they rarely understand the implications of it or realise the rationale behind political decisions. The BJP, along with the Congress, accounts for over 45% of the total vote share and almost 60% seat share in the 2009 general election and the 15th Lok Sabha respectively. Both parties are the lead constituents of the two coalition alliances in India. Any government formed next year will surely be lead by one of these two parties. This post hopes to educate people about why the BJP, more than any other party (especially the Congress) is better positioned to lead India forward. First and foremost, the BJP remains the only major party in India with a clear economic viewpoint on how the country should run. The party has repeatedly stated its beliefs in core economic principles such as free markets, limited government and fiscal conservatism. Unlike the Congress party’s disastrous socialist agenda (which was started by Nehru and continues to this day), the BJPs sensible right of centre economic views have greatly benefited this country and improved the lives of millions. Sensible, conservative right wing economic policies have worked all over the world and there is no reason for it to suddenly fail in India. Secondly, the BJP has a much better track record when it comes to governance and administration. The average Indian voter may not have been smart enough to realise it, but India truly did shine when Mr. Atal Behari Vajpayee was Prime Minister. BJP and NDA ruled states today perform much better on several parameters (agriculture,education, public health, crime and safety etc) than their congress counterparts. Indeed the India Today “State of the States” surveys over the last few years give a clear indication that NDA administered states ate much better off than UPA ones. The BJP has always had a much better stance on foreign policy than the Congress. The BJP recognised and spoke about friendship and strategic partnerships with the United States long before the Congress did so. For decades India paid a heavy price for Nehru’s foreign policy blunders. His infamous “Hindi Chini bhai bhai” slogan and subsequent efforts to build ties with China resulted in India suffering a humiliating and crushing defeat at the hands of the Chinese in 1962. After Nehru’s death, the Congress leadership continued with his failed Russian friendship policy which seriously angered the United States to such an extent that Indo-US relations remained hostile for decades. Infact the US saw Pakistan as its natural ally in South Asia! It was only during the Prime Ministership of Vajpayee did the US finally begin to see India as a friend and an ally over Pakistan. President Clinton visited India, the first US President to do so in over two decades, and as they say, the rest is history. The BJP is perhaps better equipped to deal with internal security matters. Geo politically, we live in a very dangerous neighbourhood. Terrorist have struck at will for years now. To help our law enforcement agencies take on terror groups, not only do we need good intel, we also need stringent laws which ensure that terrorists can be properly prosecuted. The BJP passed one such law when in power- Prevention of Terrorist Activities Act, 2002. The act provided our law enforcement agencies the necessary teeth to prosecute captured terrorists. However, the act proved unpopular amongst a certain section of the electorate who regularly voted Congress. So one of the first things the Congress led UPA did upon coming to power was to remove POTA and replace it with some toothless inefficient act. The reason given out was that “the act can be misused”. If the Congress party truly believed in what it said, the right thing to do would have been to pass amendments to the existing bill, which would provide necessary safeguards to check that the police do not cross the line. And if they do, exemplary punishment ought to be doled out to the guilty to serve as a deterrent to others. The Congress did no such thing. What it did do was sacrifice national security for cheap political mileage. The last reason why the BJP deserves your vote is the fact that it is perhaps the only political party in India which is not a family business. Every single party in India is epitomised by dynasty politics. Unlike the Congress, the BJP has no “first family”. It operates in a highly democratic manner and it truly is refreshing to note that this is the only party where emphasis lies on the individual. The party does not care who a person’s father was and they certainly don’t care who his son will be! The only criteria the party holds for promotions and responsibilities is your achievements and contribution to the country and to the party. The BJP ought to and deserves to return to power at the next general election. The party offers a clear decisive vision on how to run this country and has a proven track record of stable, effective governance in various states across India. While in no way perfect, the party does represent and stand for growth and development in a manner which no other party can claim to do so. The party’s presumptive Prime Ministerial nominee’s achievements are outstanding and it is clear that Narendra Modi is by far the most suitable candidate to lead this nation into a new era. While may people remain cynical of the political class on Raisina Hill, the coming general election is crucial. Frankly speaking, we cant afford to remain cynical and end up not voting, or worse, vote for the wrong party simply because we “aren’t aware”! The BJP provides a credible alternative to the existing rot and if you are concerned with the direction in which we are moving, perhaps the party deserves your vote.